The village in Ios, called Chora, is located high up on the side of a hill. It is possible to walk up and down from the port and Mylopotas Beach, but many tourists take the bus. The bus runs frequently and the price is only €1.60 (in 2013). There are also a daily bus to Manganari Beach and another bus to St. Theodoti Beach and Psathi Beach. You can also take buses to Koubara Beach and Tzamaria Beach. The timetables below is from the summer season in Ios 2013. But the buses run at approximately the same timetable every year. So you know what to expect for your next trip to Ios Greece. This bus in Ios operates between 08:00 and 24:00. It runs every 20min between 10:00 and 18:00 and then every 15min in the evening until midnight during the last half of July and first half of August. During the rest of the summer it runs every 20min in the evening instead of every 15min. This is a popular bus in Ios and you will meet many party people riding up to town just before midnight. A perfect place to meet new and interesting people to party with in Ios Greece. This bus runs once per hour between 11.00 and 23.00. These are two smaller beaches compared to Mylopotas and Yialos Beach in the port of Ios. You could walk here if you like as it is not to far from the port and Chora. Tzamaria has a lovely view of the port and the village. You will also see the ferries come and go from there. Koumbara is a lovely double beach with water on two sides of the beach. Do not miss this beach when you visit Ios Greece. Unfortunately there is only one bus per day on this route. It leaves from the Port at 12.00, at 12.05 from the Village and at 12.10 from Mylopotas Beach. Then there is a return bus at around 17.00. Manganari Beach is probably the most beautiful beach in Ios island and a lot less crowded than the more popular Mylopotas. Do not miss this beach if you have an opportunity to visit. There is also only one bus per day to these two lovely beaches. It leaves at 11.30 from the port, 11.35 from the village and 11.40 from Mylopotas. 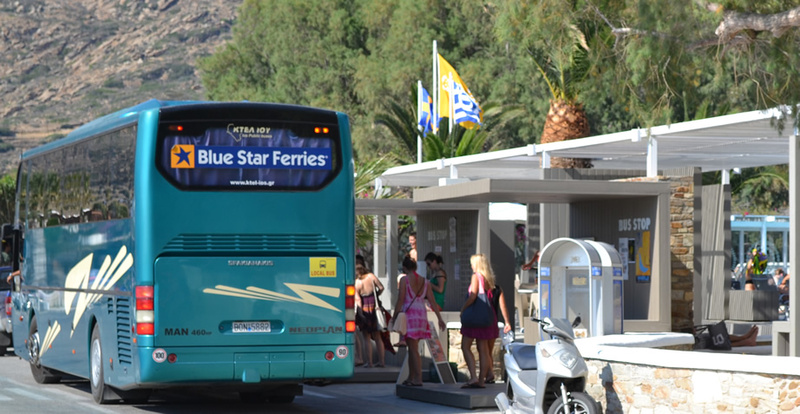 The returning bus leaves St. Theodoti Beach and Psathi Beach at around 16.00. These two beaches are well worth a visit if you can manage to get up at 11.00 in the morning after a long night out in Ios nightlife.